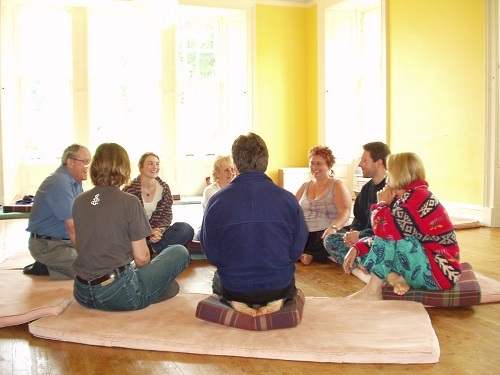 These personal stories were given by various co-counsellors present at the annual CCI European gathering in 2008, which took place near Edinburgh. As a result of the family I grew up in, I learnt from an early age that the safest approach to life was to be agreeable and invisible. I learnt to keep my opinions and feelings to myself to such a degree that I lost touch with what they actually were, buried as they were beneath layers and layers of fear and shame. I was quite the agreeable, passive, smiling doormat! Since my late 20s I have been gradually unlearning all the restrictions I took on board as a child, and have been reconnecting with who I actually am – and co-counselling has played a huge part in this journey. Co-counselling gives me a safe space to explore my feelings, to express who I am, and a space where I am met with acceptance and approval. Through co-counselling, I have grown in confidence in expressing my opinions, my needs, my feelings and my boundaries. I have explored my patterns in relating to other people, and have moved from a place of shame to a place of self-approval. I have learned how to ask for support, and how to take things at a pace that suits me, rather than needing to move at the same pace as other people. I have significantly changed how I interact with men, both in personal relationships and in work settings. Co-counselling has also helped me to “lighten up” – as I’ve shed a lot of my unhealthy rules and restrictions, I have found a huge capacity for spontaneous fun, creativity and playfulness. I am a co-counsellor only since 1 ½ year. I think the self-confidence is growing practising counselling and the awareness of oneself and others. I was very lucky to get in contact with a counselling community in my neighbour town and to learn the fundamentals so I was able to get in contact with the international CCI 2008 in Scotland. It is a supporting feeling to belong to such a network. I was in total despair and misery at the time of the breakdown of my second marriage (the first had ended in an acrimonious divorce). A friend recommended co-counselling to me (I knew he had needed help at some time in his own life) and gave me JanPieter’s phone number to contact. We met, talked, and I joined the fundamentals course he was just about to start. That gave me the space to grieve, and the tools to begin to process my hurt, grief, and anger. I have remained a coounsellor ever since – about 15 years, I think. I have participated in fundamentals, I have helped to write the consititution for CCIS, have acted as chairman for our AGH, attended 3 CCIs and helped to run the one at West Hinton, and been a member or a support group for the last 8/9 years. It has become an essential part of my life, as an outlet for emotions, a forum for discussion, debate & learning, and a source of fun, joy, new experiences and hugely rewarding companionship. It keeps me sane and reasonably balanced, and I hope I shall never have to live without the powerful outlets it offers me, and the countless opportunities to learn & enjoy new things. Attending Fundamentals Training has changed my life! It has helped me to find a confidence and an acceptance of myself that I did not know I felt. I have learnt to know my strengths & weaknesses with greater awareness. It has taught me how to manage conflict. When my father died I didn’t say goodbye to him. On his last day his eyes were closed and he could no longer speak: I sat with him and held his hand for the first time in 20 years, and for one moment he opened his eyes and we looked at each other. That moment of connectedness stays with me of course, but I do so wish that during the five months of his dying I could have put words to my feelings, my wishes, my griefs, my joys, my thanks, even. And I wish I had the skills to communicate some of these to him and in a way he could hear them, with me respecting and knowing about the defenses he had naturally developed as a youngster. I didn’t even say ‘thanks’. Well, I don’t blame myself – I was only 29 and had never heard of the term ‘personal development’ and I thought ‘psychotherapy’ was for nutcases, and I thought ‘counselling’ was careers advice for students. Things are different now. I still don’t say to my mum and sisters ‘I love you’ but I’ve moved a lot in their direction. My mum’s 82 and I’m not leaving it all to her dying day. When my mother died I got a lot of support from my co-co teacher, she allowed me in a role-play to get out all my anger which helped me a lot and also I could figure out how to give a statement to the girl working at my working place with being clear and constructive. I really value the contact with people who have learnt to be in touch with their truth. I also value the sense of fun and creativity which is an essential part of becoming my true self and is really enjoyable. I have started to become a whole person since doing my fundamentals course and am able to express my feelings and talk about the good and the bad things in my life in a healing way. Co-counselling gave me the courage to leave my marriage and change my life. I did my fundamentals in 1983 and was suddenly surprised to find that it was ok to express my feelings and that I could make space for myself amongst all the tasks of raising five children and caring for my husband. After two years of co-counselling I got myself a job teaching art history in the art school and I moved with my children to another part of the city. Of course I got into a mess with my emotions and new relationships for a few years but gradually I gained self-confidence and strength and negotiated to get my job back in the diplomatic service, and lived a fuller life that I would have if I had stayed in the married role I had been conditioned to believe was the right one. Without co-counselling I think I would not have dared to try new things and to listen to my inner self. To me co-counselling has become an oasis, a free space – on the one hand, for working on ‘old stuff’ of my childhood, and on the other hand, it’s something very precious to me to cope with all kinds of distress in every-day life. Through co-counselling I have discovered how much energy I actually have. I learnt to co-counsel nearly 20 years ago. After periods of doing a great lot of and others of doing hardly any co-counselling I have for about five years have regular co-counselling sessions every one or two weeks. I started co-counselling while I was living in Mozambique (1980-89) where I felt that I needed input for emotional growth. I took the fundamentals during a holiday in the Netherlands, it was great. I felt I could open myself towards my emotions, it was like learning and clearing my mind and body. I got a lot of energy and a feeling of renewal. Together with my husband I am part of an ongoing couples group. We meet about 4 times a year. We do sessions and we support each other in communicating challenging topics. This stimulates growth of my relationship with my husband. Regular sessions are like sending my car to the garage on a regular basis. I send my body and mind in revision. I have regular phone sessions which help me very much to feel where I am at that moment. An extra is that the co-counselling community is an international community. I experience this community as a possibility to learn about different cultures in co-counselling – different national cultures and different co-counselling community cultures. Specifically we have ways how to deal with conflicts which help in many occasions to resolve conflicts in a peaceful way. We work from trusting the conflict partners to find some common ground. I some occasions we agree that we disagree and try to live together in the community in that way. The fact that we work with support and trust persons helps a lot when working in difficult conversations. For me co-counselling is a life-changing learning experience! Co-counselling taught me many skills that I use regularly at work….. and in all aspects of my life….. Being in touch with my body – looking after myself when I am sick – how to take time off work – how to share my body with someone in joy. I still remember doing my fundamentals in Bristol over 20 years. I felt a sense of relief to be able to share my secret worries and shed many tears. I also discovered a freedom in just letting go and being myself – feeling free and playful. I am moved even writing these words. Co-counselling has given me back a sense of who I am. I realised how depressed I had become and overcame this. I was able to take risks, such as improving my relationship with my parents. Stumbling into a co-counselling fundamentals was one of the best things I have ever done in my life. and I have not found that they can do more than co-counselling can. Overall, co-counselling has helped me to become more loving and less defensive. Two particular things I would pick out. One was coping with a slight overweight and associated eating patterns problem. I had been co-counselling on and off about this for quite a long time. What was interesting to me was that I was aware of the moment when it changed, not in a co-counselling session but it was at a co-counselling event. From that moment on my eating patterns changed and I now have no difficulty staying at the weight I want to be. and not collusive. Also how we can organise and make decisions without any formal structures or hierarchies. I discovered co-counselling at a time when I was very unhappy and had little or nothing in the way of personal support. It was a relief to find a place safe enough to begin to allow out some of the feelings that had been suppressed for many years. At that time I was very shut-down and defended, nursing a lot of old hurts. I was uncomfortable in groups, and could appear withdrawn or even hostile. So I tended to get critical feedback about people finding me aloof and unapproachable, and not knowing who I was. Early co-co residentials were extremely challenging, as I knew nobody and nobody knew me. I was surprised to encounter tight groups of people who had known each other for years. Gradually I began to find friends and allies and to feel a little more comfortable. Over the years co-co has been a vital part of my growth and development, complementing other effective ways of working . It has given me a place to work through many of the old traumas and discover new ways of being and of relating to others, as I have steadily become more confident and more visible. Starting to teach co-counselling recently has reminded me just how much I value it. And I haven’t heard that I’m unapproachable for quite some time now – although people still find me challenging in other ways. This year when my son was gravely ill. I came closer to despair than I have ever come. The co-counsellors who lent a hand to support me were a lifeline which helped me to carry on supporting my son and keeping him alive. I was able to come back from the hospital each day and have a session on the phone or in person and really wail, scream, cry and rage out my frustration and grief. It was as if I could say anything to my counsellor and be held and supported. Because of them, because of co-counselling, and because I know how to be a client, I was able to keep going, to keep functioning in the outside world, even under difficult circumstances. I come from a family where the habit is to bottle everything up and carry on until we break down, or turn to drink to suppress our feelings. Through co-counselling I have learned how to let my feelings out, to cry, laugh, scream, shake, yawn, shout, or whatever I need to do, within a session. After a session I can carry on thinking and functioning so much better, even when life is tough. It is my ongoing practice to keep in good health. I used to work as an engineer with machine tools. People puzzled me, they were hard to understand. I’d make friends and think everything was wonderful, then suddenly it ended and I never knew, never found out what happened, what did I do wrong? So I focussed on the machine. This was good, everything clear and comprehensible. When a machine went wrong there was a reason capable (ultimately) of being found and corrected. Doing co-counselling enabled me to learn about people. I learned to make friends and stay friends. I can love and equally be loved. Being equal is really important to me and is key to relationship and friendships working well long term. Once upon a time, a long time ago, when I had been doing co-counselling for only a year or two (in 1984 or 1985, in fact), I was struggling to write something difficult and technical at work, a guideline about which technology should be used in particular circumstances – something needing technical accuracy but also a high-level vision which captured all the really key points of the various options and set them in perspective alongside each other. I tried to write it one day and got stuck, all my drafts had some major problem. I tried to write it another day and the same thing happened; I had successfully produced other similar documents but on this one I was really stuck. That evening I had a co-counselling session and worked on completely different stuff, got out a lot of feelings about other things that were going on in my life at the time – I no longer remember the details but almost certainly about relationships; a lot of discharge – mainly fear. In the morning I had a go at my difficult technical document for a third time and words that expressed everything I wanted to say just flowed onto the page, I had finished it in a couple of hours and it captured exactly what I wanted to say. decisions and in discussions about ventures and aims with colleagues. I know what I want and I can communicate this more easily and directly. That is an always noticeable advantage in my private live too. Over 10 years ago when my children were quite young, I realized that I had to find a better way to deal with my feelings of frustration and anger. I knew that it was completely unfair and quite destructive to react to my children’s needs through my distress. I began to search for help and found co-counseling. I learned how to release my distress in a healthy manner by gaining an understanding of my behavior – where the negative emotions were based and having weekly sessions for discharge. My issues revolved around my own childhood: anger at my parents for not meeting my needs, feelings of guilt for things I did as a child – not having the skills required to make certain decisions, incongruity with messages I received in my youth and what I wanted as an adult. I have learned so very much about myself and how I see the world. The enormous gift of co-counseling has enriched my life more than I can express – the true understanding of how people relate to one another and the richness of making connections through love, respect and recognition. I appreciate being human and not being hung up on fears. I no longer rate myself in a friendship as being the source of solutions for others’ problems. Each person has the knowledge and ability to resolve their own issues with the love and support of a trusted person who knows how to listen. My children know that I believe in them, that their mother knows they are brilliant, capable and very special individuals. I have learned to listen to myself, to those around me and to cherish and celebrate life. I started co-counselling in 1991 aged 22. Some of my friends in Manchester had introduced me to it and I had been doing ‘co- listening’ with others for a few years. At the time I was looking for a way to process some feelings of depression and difficult stuff about my family. I was a high achiever at school and got a buzz out of succeeding in everything I did but at the same time there was a feeling of loneliness and emptiness inside which I think is where my true feelings were buried. It was a revelation to me that people would support each other to let out ‘difficult’ feelings and this was so liberating. It was liberating to let out anger, sadness and frustration and have a safe place to do this. A lot of the stress in my body was released. I was also in therapy at the time and maybe from the outside it looked as I was overdoing it a bit. I found it easy to let stuff out and did loads of catharting for a number of years. I co-counselled with friends and people locally twice or three times a week for about 3 years. Perhaps what I struggled with was integrating my world of feelings with the outside world, the world of work . There seemed to be such a huge gap between my inner world and what was going on outside. I never really managed that well until recently. Now I run a training company which I set up and which has been very successful. Maybe all of a sudden the timing was right and I could match up the different parts of myself in a coherent way. Perhaps I just do things in an extreme way? If I could do one thing differently I would have done more not just to let out feelings but use the insights to run the rest of my life more successfully. For this I have used co-coaching, having done coaching training later on. Being a co-counsellor has supported me to be more fully myself, accepting different aspects of who I am. Sometimes being able to do a non-verbal session is very liberating, as I get bored of using words all the time. At other times it is useful to just talk and reflect on things. I have been in a number of support groups, most of which have last around 6 months. I have done loads of residential events and is my way to be absolutely whacky and have tremendous fun- in fact I would like to be who I am in a residential more of the time (I’m sure others will feel the same way themselves). I am grateful for all the fun and absolutely lovely times I have shared with my co-counselling friends as we make our lives the best they can possibly be. Co-counselling has made it possible for me to join groups of all kinds, educational, social, therapeutic, without suffering from extreme anxiety and panic. My daily life had been very inhibited and I had not been able to advance in my job or travel easily away from home because of panic disorder. After some time using co-counselling sessions and groups to unravel my past life, and rethink old negative ways of feeling and behaving, I now take great delight in joining groups of all kinds for learning, music, socialising, travel and not least co-counselling. I see the co-counselling groups as a wonderful microcosm of my life at large, and enjoy feeling free to try out all sorts of new ways of being with people, to my great joy. Every co-counselling group I attend, particularly the residentials, I marvel at how much I have changed. I am able to speak up clearly, take part on an equal basis and I’m experiencing a lot of joy, fun and fulfillment along the way. Co-counselling and my marvelous fellow co-counsellors have provided the backdrop to a different kind of life for me, full of new people, new experiences, adventures, variety, confidence and growth and continue to enhance my life and my relationships on a daily basis. When I did my first fundamentals in Co-Counseling I was 39 and I could cry, which I couldn’t since ever I was a child! I felt so much relieved and happy! I learned since that time so much about my own feelings that I could handle them much better. It was wonderful to feel how well it went to express my emotions and not needing to be afraid of having fear and distress. Since I knew I could easily get rid of them by discharging in a safe place. I still use sessions to discharge, but for me it is now more important to use the time of a session to focus on the future and make concrete action plans. Five years ago I was trained as a practitioner and later on as a master and a trainer of NLP. This improved my ability to work as a client to chose for focussing at my empowering thoughts and recognize my depressing thoughts and especially chose to stay at the side of the cause, to take initiatives, to look for more options, to look for the positive intentions of the other. Therefore I have the idea to be much more successful in my life! I’m member of an ongoing couples co-counselling group for 12 years, member of an regional group, and doing regular telephonic sessions.